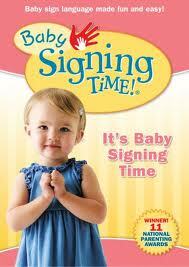 MamaBreak: Baby Signing Time! Giveaway! LOVE Baby Signing Time!! We've been borrowing the series through the library, this would save on my late fees! yay for giveaways! I love these movies! Love love love this! Hope I win this -- want to give it to one of my preggo mama friends! I hope I win - we really want to teach our child to sign! Signing time rocks! Thanks for the chance! What a great giveaway! I love Signing Time! I love these videos that I've borrowed from our library. Would love to own one though--they are so good! I love signing time! I would love to get the baby version for my sister-in-law who is having a baby! I love love love baby signing times. It used to come on PBS and our daughter would watch it and learn so much! We used sign with our son and it helped tremendously with the frustration of not being able to tell us what he wanted/needed. We plan to use it with all our children.